IF A STEALTH FIGHTER plane had an earthbound country cousin, it might look like the 1947 Case VAO tractor owned by Francis “Sandy” Olson of Port Orchard, Washington. Unlike the combat jet, however, this vivid V-shaped beauty could hardly avoid detection. 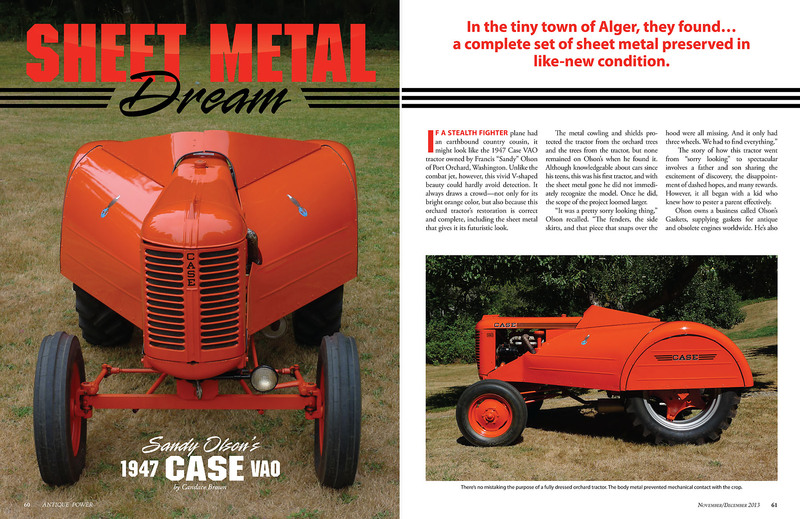 It always draws a crowd—not only for its bright orange color, but also because this orchard tractor’s restoration is correct and complete, including the sheet metal that gives it its futuristic look. The metal cowling and shields protected the tractor from the orchard trees and the trees from the tractor, but none remained on Olson’s when he found it. Although knowledgeable about cars since his teens, this was his first tractor, and with the sheet metal gone he did not immediately recognize the model. Once he did, the scope of the project loomed larger. 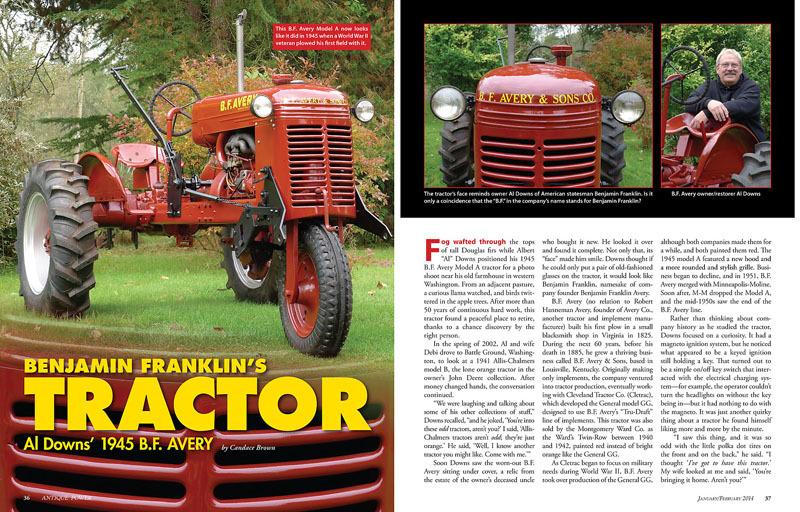 FOG WAFTED THROUGH the tops of tall Douglas firs while Albert “Al” Downs positioned his 1945 B.F. Avery Model A tractor for a photo shoot near his old farmhouse in western Washington. From an adjacent pasture, a curious llama watched, and birds twittered in the apple trees. After more than 50 years of continuous hard work, this tractor found a peaceful place to retire, thanks to a chance discovery by the right person. I really enjoy the look of this website. I hope that we can get together soon. It was nice to meet you too, Patty. Thanks for taking the time to look at my site. Hopefully we can get together sometime during this busy season.